Wow, so what you are telling me, Mr. Google definition, is that muesli is a mixture of all of my favorite breakfast ingredients?!? Last night I decided to do a little experimenting in my dorm room after volleyball practice. “Oooo, I get to see breakfastwithbex in action!” said my roommate Abbey. Indeed, she did. It was definitely fun rummaging through my food drawer and fridge, searching for the perfect combination for a fall muesli mix. In order to prepare Bex’s Pumpkin Spice Raisin & Apple Muesli I combined plain Quaker oats, a raisin medley (BJ’s Berkley & Jensen mix of jumbo natural raisins, jumbo golden raisins and jumbo crimson raisins…thanks Grandpa!) a drizzle of honey, shredded apple, Zico coconut water and Chobani Pumpkin Spice Greek yogurt. 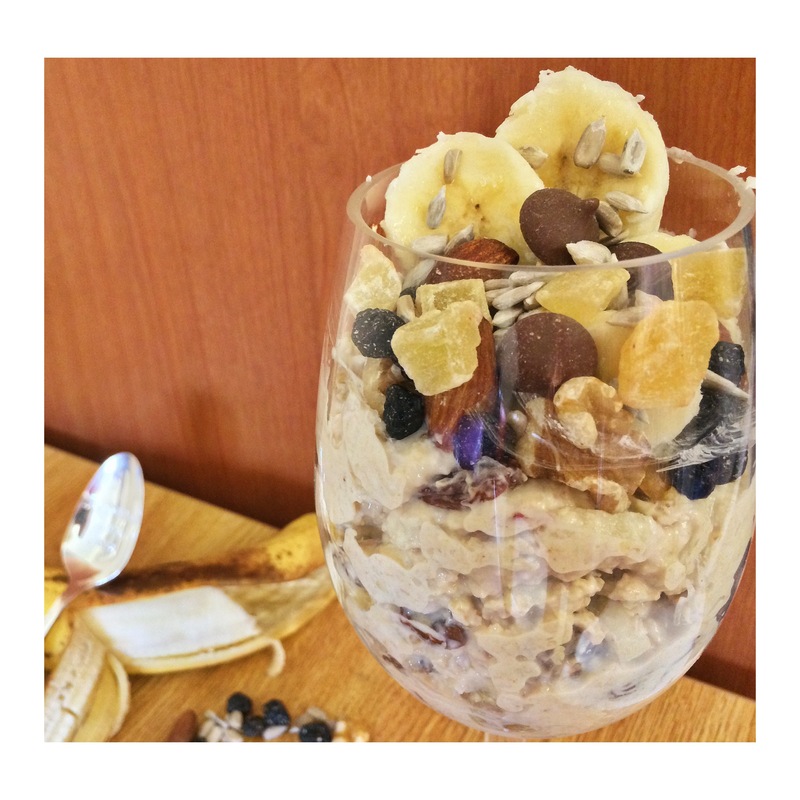 You can really be creative with the kind of muesli you want to create! It is a great breakfast option that is high in fiber and is very filling. It covers many important nutritional benefits from whole grains, protein and fatty acids from the addition of nuts, to a great source of dairy and fruit. Although, I am guilty…I just had to add a few chocolate chunks to this autumn breakfast specialty. But, I don’t regret it one bit. In a small bowl or dish that can be refrigerated, combine oats, raisins, and honey. Shred or cut half of an apple into thin slices, then add to the mix. Next, add the coconut water and yogurt and stir until ingredients are combined. Cover the muesli and refrigerate overnight. In the morning, simply spoon muesli into a bowl and garnish with fruit, granola and/or nuts. Bon appétit!